Last Tuesday I wrote about how we identified the things users need from government online, and how that’s guided the building of GOV.UK. Today I’m going to tell you bit more about how that’s helped us ensure that GOV.UK meets the needs of businesses. The GOV.UK team at GDS started by analysing everything on the Business Link site in the same way that we approached Directgov; by working out what user needs each page was trying to meet. When we looked at why people were coming to Business Link, three main categories of user need emerged. Many people thinking about starting a business find their way to the Business Link website via search engines. They want to know what they need to think about before starting, what to do when they take the plunge, and what assistance the government can provide for them. That last one is really important - the government has a lot of support schemes for startup businesses, and people want to find out what help they can get. They also want to read about things like hiring people for the first time, and about what they need to carry out the work they plan to do - licences, permissions, that kind of thing. And they want to know how to avoid making common mistakes. There are also lots of businesses who have been trading for a while, and want help with growth - help thinking about what options they have, to specific advice about protecting their intellectual property, or what government schemes they might be eligible for, and more. And, of course, there are businesses of all shapes and sizes that just need to access information about government regulations or to access digital public services - there's a lot of them! So, we needed to make sure that GOV.UK provided for these groups of people, no matter whether they're individuals who are just about to become self-employed, a growing SME or a large multi-national firm. For those interested in setting up or growing a business, we’ve produced guides and tools that help people understand what research they need to do and how the process of starting up will work, and what to consider when they want to grow their business. We also make sure that people know about government schemes for start-ups, and we help them to understand what the rules are around things like employing people, paying taxes, and selling goods and services. One of the new tools we’ve built is the licence finder, a service to look up an area of interest or an activity (mostly business activities, with a few exceptions) and find out what licences they need to get - in many cases, you can also apply online. 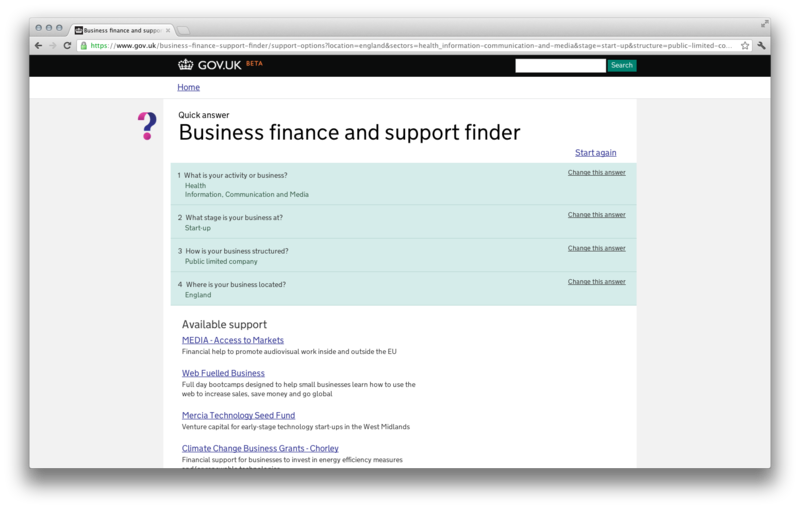 We also built a tool, the business finance and support finder, to tell everyone about the 800+ government support schemes that are available for people starting up and growing a business. You can use it to find out exactly which schemes you could be eligible for, depending on the location, sector and life-stage of your business. Businesses have hundreds of distinct needs, so we've written hundreds of straightforward guides and built dozens of tools - each focused on a specific user need - to give them the information they need to trade safely and legally. Where people need more specific detail (e.g. where specific regulatory terms might be required) we’re linking to "detailed guides" so that the minority of interested users can find what they need without disrupting the experience of the majority of users. 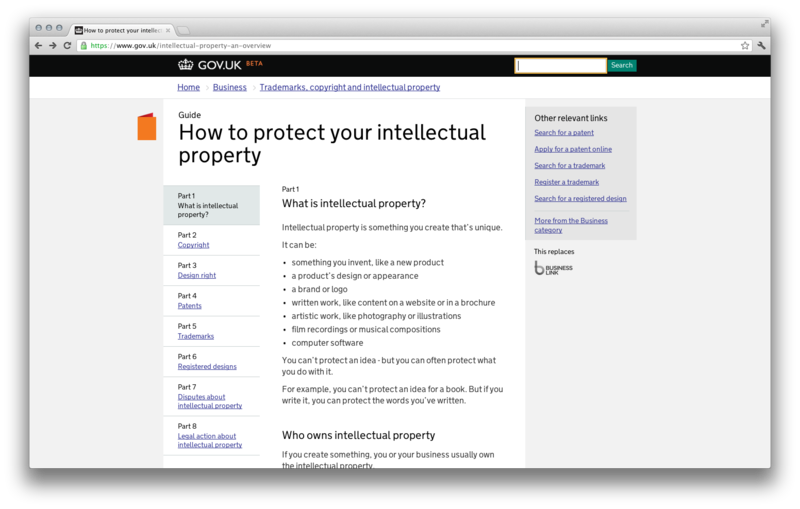 One of the things that you might notice is that GOV.UK doesn't give as much advice about things like marketing or IT as you might have found on Business Link. The simple reason for this is that the data showed, very clearly, that this content was used infrequently by a small number of users, and it wasn't the reason that the vast majority of people came to Business Link. What's more, those topics are frequently covered better by professional bodies and others on their own websites. Where users have bookmarked pages of advice on Business Link, we’ll be directing them towards archived copies of that content (on The National Archives), so if people still want it they can find it there. In some cases, we'll also be offering them links to third party websites who offer trusted, reliable information about the subject. These are typically the third party organisations who provided that original content for Business Link. 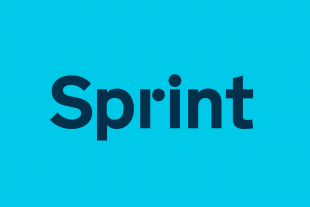 We’re making it clearer, simpler and faster for people to find the information they need to start, run, and grow their businesses, but there’s always going to be room for improvement. We’ll be doing that every day from now on, based on the feedback we get from businesses and with the data that millions of users every week will generate as they move through GOV.UK.